I apologize that I haven’t written in a while. We are moving into grant-writing “season”. We are writing a few proposals that address new rice pest problems. You’ll hear more about those projects if they are funded. Just a quick update on the latest news. We continue to receive reports of rice stink bugs in second crop rice, in some cases with very severe pressure. You can read about this by clicking here. I also received a call today asking what the Re-entry interval for Tenchu 20SG is. The answer is 12 hours – so this means you can safely enter the field 12 hours after the insecticide application. We have also had some reports of armyworms in crawfish rice – this is in the Evangeline Parish area. Remember that the only thing registered is BT type products, which are really only effective controlling smaller caterpillars. Any other insecticides have the possibility of killing crawfish stocked in the pond. 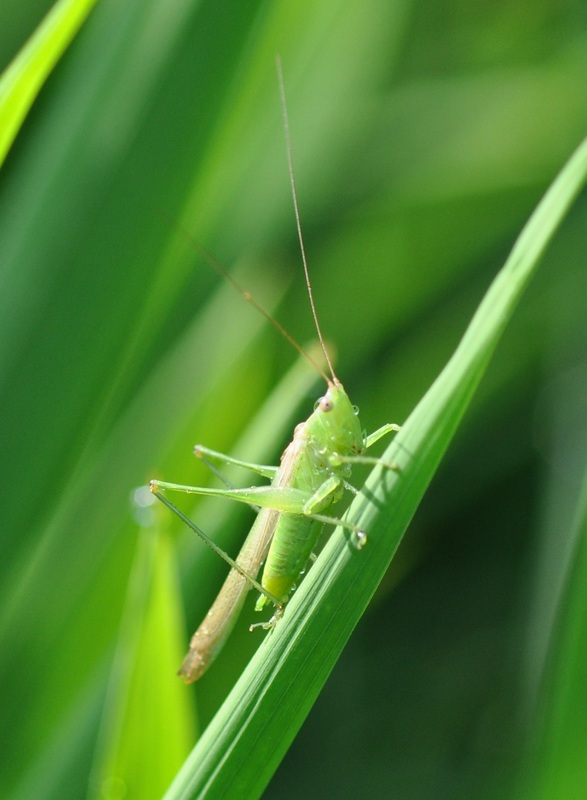 The LSU AgCenter Extension Entomology program has a couple of trainings this month. 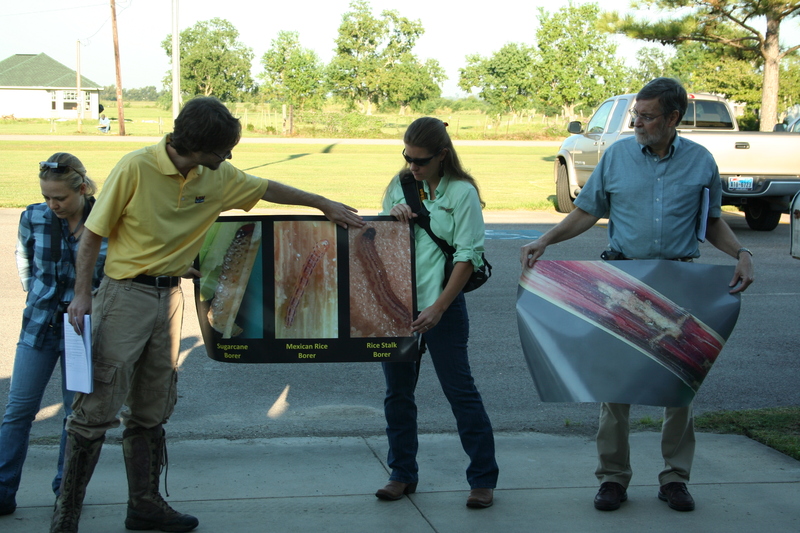 Next week we have the annual advanced entomology training at the Rice Research Station in Crowley on Tuesday, Sept 13 from 9 am to noon. I hope you can join us. I’ll start off by talking about early season pest problems (chinch bugs, bill bugs, sugarcane beetles, etc.). Then we will spend the rest of the training talking about Mexican rice borer management recommendations. Click here for a link to the agenda. We will have three speakers. Speakers will include Mo Way from Texas A&M AgriLife. Mo has studied the MRB for more than 20 years and has graciously agreed to share his insights with us. Dr. Julien Beuzelin (recent graduate of LSU) will talk about his research studying the biology, behavior and secondary host plants (weeds) of MRB. Finally, I will give a presentation on management recommendations and opportunities for cooperators to help us expand the pheromone trapping program. We will have plenty of time for questions from the audience. Later this month, Gene Reagan and Mo Way are co-hosting their annual MRB site visit in Beaumont, Texas on September 27 to 28, 2011. This is an excellent opportunity to gain first-hand experience scouting for MRB in the field. You will also have the opportunity to learn about the latest research on this pest. If you are using social media, you are welcome to join the LSU AgCenter Rice Entomology Facebook group page. This is a great place to keep up to date on the latest observations from the field and to share your knowledge with others. Click here to join the group. If you don’t have a Facebook account, you’ll need to create an account first and then request to join the group. I look forward to seeing many of you at the meetings this month. As the MRB continues to spread across Louisiana, it is becoming more critical for those associated with the rice and cane industries of Louisiana to become familiar with identification, biology and management of this pest. Drs. 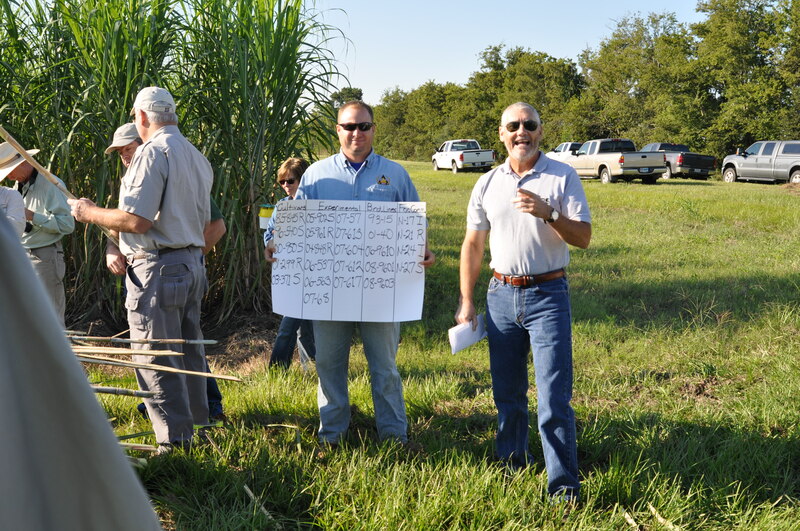 Gene Reagan (LSU AgCenter) and Mo Way (Texas A&M Agrilife) are hosting their annual Sugarcane Field Research Site Visit in Beaumont, TX on September 27 and 28, 2011. 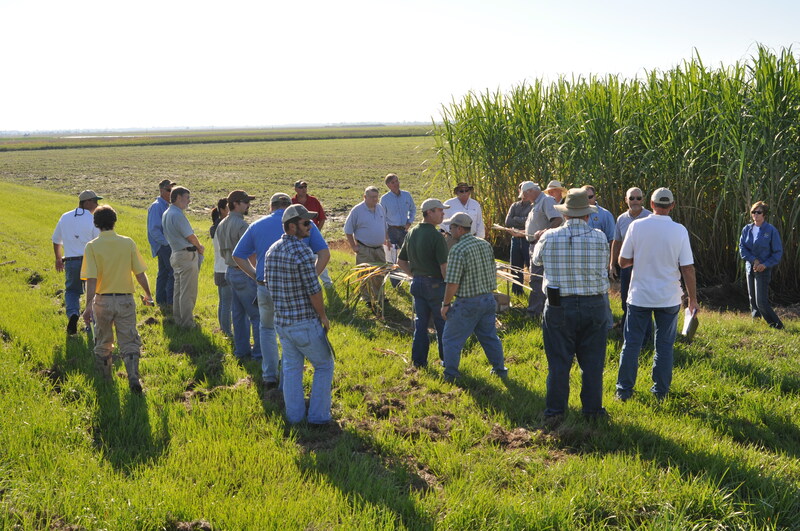 Louisiana and Texas Sugarcane and Rice Consultants, Agricultural Extension Agents, and Industry Cooperators are invited and encouraged to attend. Please do not take any live insects from this location! Mr. Blake Wilson: Use of MRB pheromone traps to help with scouting. Dr. Julien Beuzelin and Mr. Matt VanWeelden: Multi-crop bioenergy research. or visit demonstration of sugarcane stalk splitter machine (Gene Reagan). Wednesday, 28 September – 11:00 am Sun grant/Chevron/Beaumont energy cane and high biomass sorghum research near main building, Texas AgriLife Research and Center at Beaumont, 1509 Aggie Dr., approx. 9 miles west of Beaumont on Hwy 90. On Monday, Johnny Saichuk (rice specialist), Donna Lee (county agent – East Caroll Parish) and I headed over to Beaumont, Texas for the annual Mexican Rice Borer (MRB) Site Visit. This meeting is held annually to share the latest results of a long-running cooperative research effort between Texas A&M and the LSU AgCenter. The research programs of Dr. Gene Reagan, Mo Way, Ted Wilson, and Bill White were showcased. The Mexican rice borer is a significant pest of rice and sugarcane production in Texas. It was been moving north and east across the rice and sugarcane belt of texas since the early 1980’s. Infestations result in significant reliance on insecticides to control this pest. The USDA breeding programs are also selecting for resistance to borers in sugarcane. I attended this training a few years ago, but this year it had a little more significance, as I have recently taken on sugarcane extension entomology responsibilities. This is in light of the retirement of Dr. Pollet, and our inability to fill his position due to the ongoing budget crisis. So, I will have fun learning about sugarcane this next year. 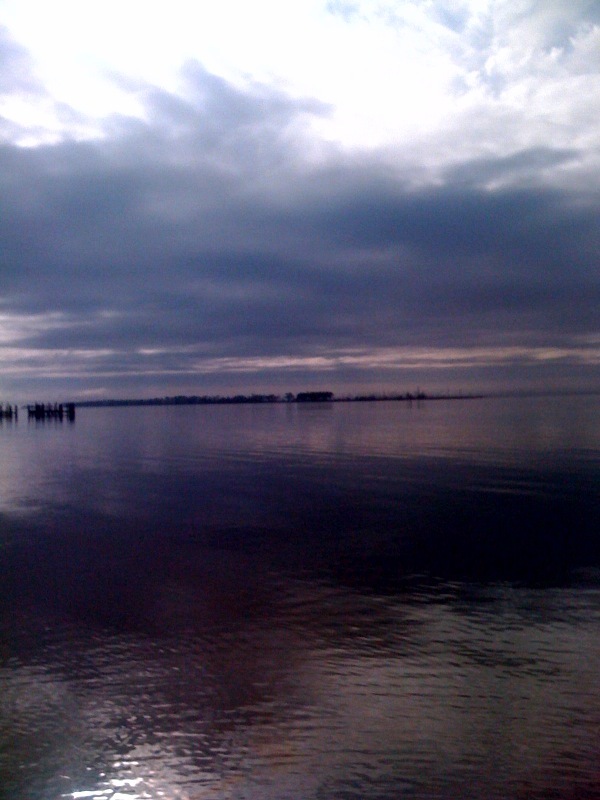 I can embrace one of my favorite quotes “life begins at the end of your comfort zone” – Neale Donald Walsh. 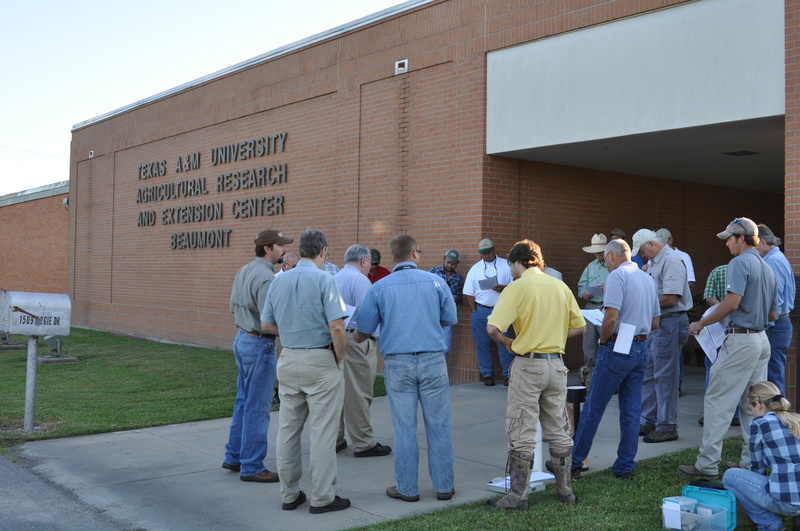 Bright and early on Tuesday morning, we gathered at the Texas AgriLife Beaumont Center. Dr. Ted Wilson, Station Director, welcomed us to the facility. The group listening as Ted Wilson welcomed us to the Beaumont Center. Then we listened to a few comments from some of the scientists and graduate students conducting research on MRB. Dr. Gene Reagan talked about some of the latest research on MRB which has been funded by over 1 million in competitive grant funds over the past ten years. His student, Julien Beuzelin discussed his research on alternate hosts for MRB (weeds). Julien is also studying survival of rice in comparison to a number of different weeds. His research will be used to develop ecosystem level management strategies. Julien Beuzelin demonstrating proper identification of Mexican Rice Borer. We piled into our trucks and headed out to look at the sugarcane plots. In this area, USDA is evaluating varieties for resistance to Mexican rice borer. The group listening to Gene as he introduced the research conducted in the sugarcane plots. Dr. Bill White and his technician Randy Richard are evaluating a wide variety of lines, some of which are susceptible or resistant to borer infestations. 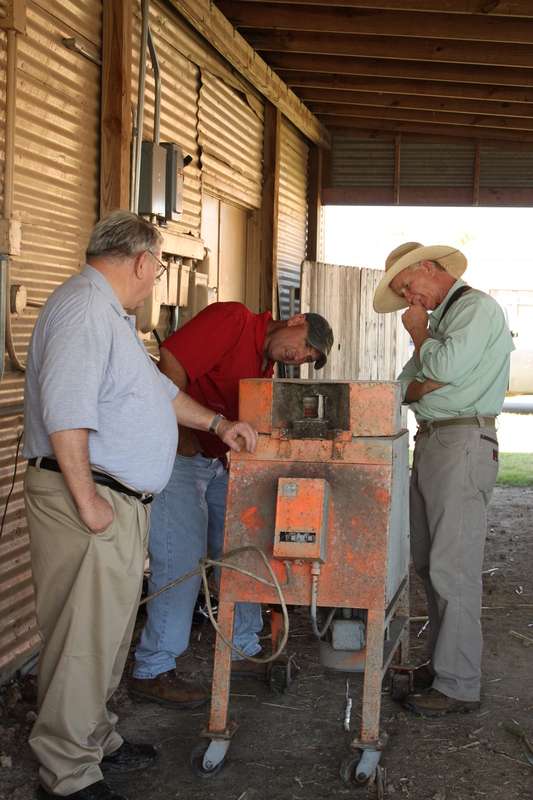 Randy Richard (left) and Bill White of the USDA in Houma - discussed the varieties of sugarcane under evaluation at this test site. This information on varietal resistance will be valuable when the Mexican Rice Borer becomes established in Louisiana, which will likely occur in the next ten years, due to natural movement across the border with Texas. Next, the group headed over to look at the Sun Grant/Chevron Energy Cane and High biomass sorghum research area. These sorghum plants are really something to see. Post-doctoral scientist Dr. Lv is working with Ted Wilson to evaluate the physiology and growth of the energy cane and sorghum. 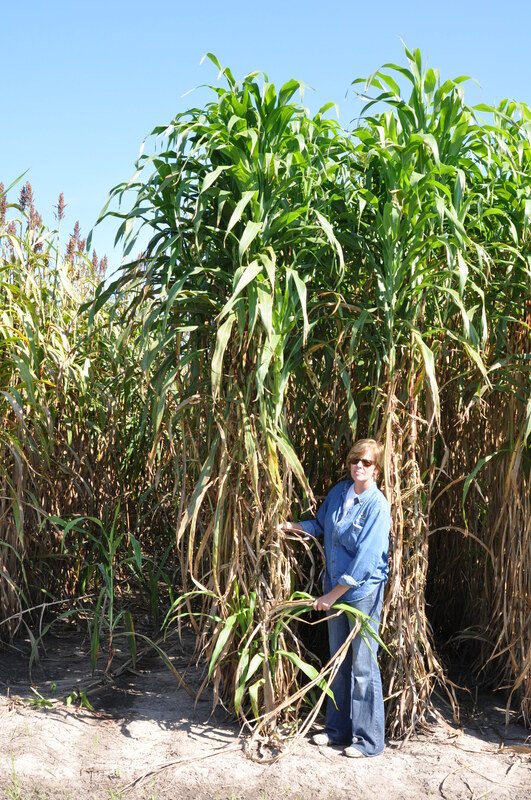 Donna Lee standing next to some of the sorghum - it was incredibly tall! After marvelling at the sorghum, we enjoyed a demonstration of the cane splitting machine. This invention has improved the safety of sugarcane researchers. It mechanically splits the cane, avoiding the need to use a knife to split the cane and look for borer injury. Gene Reagan demonstrating the cane splitter. Finally, Mo Way showed us some of his rice plots where he conducted trials on insecticides to control Mexican rice borer this season. Borers are a much more significant problem in Texas rice than they are in Louisiana. Thus, Mo spends quite a bit of time exploring management options for these pests. The program book for this training can be downloaded from www.lsuagcenter.com by clicking here. If you’d like to learn more about the Mexican rice borer, and ongoing research programs, please contact Dr. Gene Reagan. You can learn more about MRB in this extension publication. Photos taken by Natalie Hummel, Anna Meszaros and Becky Pearson. This week, I’m at the 33rd annual meeting of the Rice technical working group (RTWG) in Biloxi, MS. This meeting is a joining of all the rice research/extension faculty from across the US – and many from other countries – that occurs every two years. For many of us research and extension folks, it’s a reunion and a chance to compare notes on what we have seen in rice fields across the U.S. There are also a number of rice farmers and consultants at the meeting. I met some growers from Texas who said that they started coming to this meeting because they learned about new technology one and a half years before it became common knowledge. This gives them an edge in their production practices. Today, I enjoyed the presentations in the CCA training that was held before the opening reception of the meeting. One of the presentations was about rice insect management practices. Dr. Gus Lorenz (University of Arkansas) and Dr. Mo Way (Texas AgriLife) were the featured speakers on this topic. They gave excellent presentations about rice insects management options – focusing on the new seed treatments that are now available to many producers in the south (CruiserMAXX and Dermacor X-100). Mo presented some interesting data on the effect of the Dermacor X-100 seed treatment on borer control in the ratoon crop. He has found that Dermacor applied to rice that is seeded for first crop, also provides some level of control in second crop (this is measured by taking whitehead counts in test plots). This is an interesting observation – especially as the borer complex becomes more important across the southern rice belt. These are some good things to consider when making your seed treatment decisions. Contact me if you have any questions about the new seed treatments. I am preparing two presentations for Wednesday during the plant protection panel. I will talk about the results of the rice water weevil demonstration in 2008 and 2009. I will also present a paper on the detection of colaspis in Louisiana in 2009 field season. My associate, Anna Meszaros, is also presenting a poster on the results of the 2008 Louisiana rice insects survey. Thanks to all of you who took the time to complete this survey. The results have received considerable interest from the industry. I’ll keep you posted on any other new research that I learn about at this meeting.